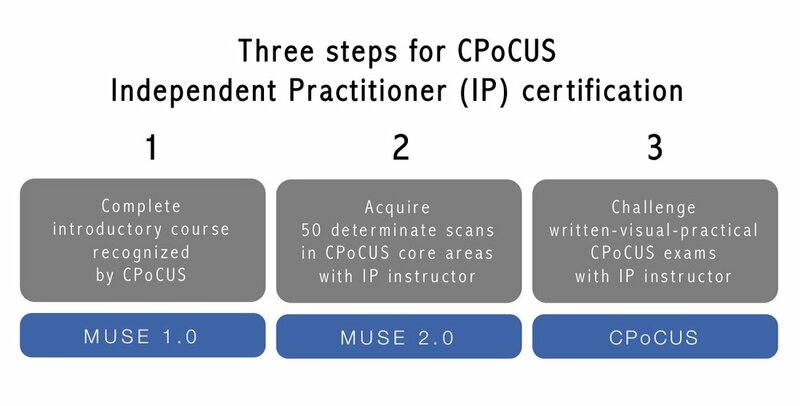 The MUSE 2.0 course is recognized by the Canadian Point of Care Ultrasound Society (CPoCUS) and therefore supervised scans during this course count towards achieving CPoCUS-IP certification. To achieve CPoCUS-IP certification, you must acquire 50 supervised scans in 6 core areas (Cardiac, Aorta, Abdomen , First Trimester Obstetrics, Pleural Effusion, Pneumothorax). The 50 supervised scans can be acquired during the MUSE 2.0 course. Our CPoCUS-IP-certified instructors access the quality of each scan and determine whether the scan can count towards the 50 supervised scans. While the CPoCUS written, visual, and practical examinations are not included in the MUSE 2.0 course, our instructors can provide examinations at a later convenient date once all scans have been acquired and the theory has been reviewed. Contact us for further information. Please note: The core areas are cardiac, abdomen, basic lung, aorta, and first trimester pregnancy. The 50 scans can also be obtained by hiring an IP certified individual to supervise the scans or through completion of other certified ultrasound courses. Pre-course reading is essential to optimize your hands-on experience during the practical sessions. You can prepare for the course by reviewing modules in the course textbook, Bedside Ultrasound-Level 1 or Échographie Ciblée-Niveau 1 and free online instructional videos. The textbook is included in the registration fee, distributed prior to the course, and can be read in a few hours. It is aligned with the course objectives and pre-course test. Post-course review of the textbook will help to solidify acquired concepts and skills. Participants are encouraged to identify the areas they wish to improve and review the appropriate chapters in the textbook. The course format allows for over 50 standardized patients to be scanned over a total of 16 hours (3-4 scans/hour). Our teaching faculty have extensive expertise in teaching bedside ultrasound and are CPoCUS-IP certified. Their experience spans practicing and teaching ultrasound in rural and urban ERs, ICUs, medical wards, and office-based clinics as well as international aid in low income countries.